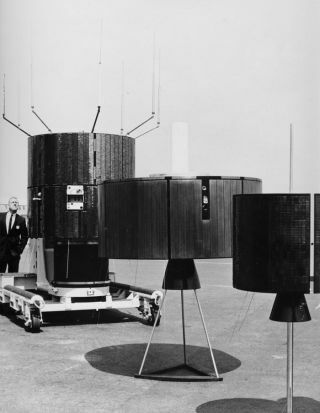 Space History Photo: Olympic Game Communication Satellite "Birds"
These replicas of the communication satellites used to broadcast the 19th Olympic Games from Mexico City to Japan and Europe went into orbit over the Atlantic in April of 1965. In this historical photo from the U.S. space agency, the replicas of the covey (flock) of synchronous communication satellites that were used to televise the 19th Olympic Games from Mexico City to audiences in Europe and Japan. The satellites are shown at Hughes Aircraft Company, Culver City, California, where they were built for NASA and Comsat Corporation. In the center is a full- scale model of the Intelsat II satellite, which was used by Comsat to send color TV direct to Japan via a Hughes ground station installed near San Jose, California. Left of Intelsat is the NASA's ATS-3 (Application Technology Satellites), which transmitted the picture portion of the Olympics to Europe and the Early Bird (right) transmitted the voice commentary of the European telecast in a dozen languages. These communication satellites went into orbit over the Atlantic in April 1965.